Medical illustration students visually support allied health instruction and research. During the first two years, the program focuses on drawing and traditional illustration skills. During this time students are attending human biology, anatomy, and physiology classes. 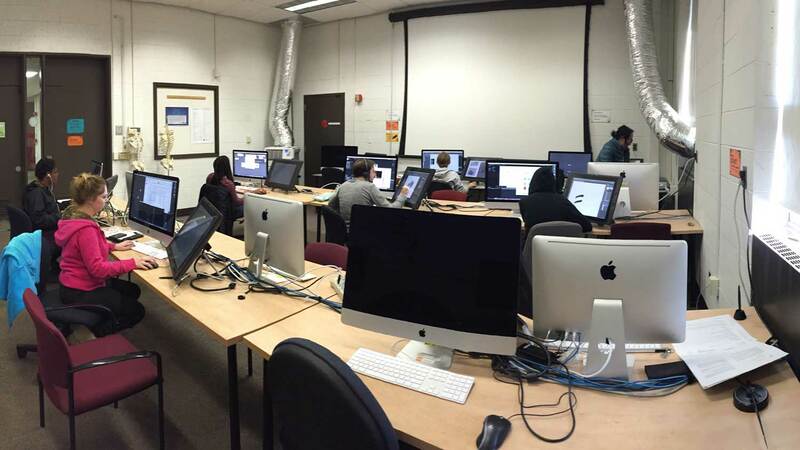 Building on these courses, the third and fourth years emphasize 2D and 3D computer illustration and animation. In addition, third and fourth-year students also attend Human Gross Anatomy, which includes full head to toe dissection and creates surgical illustrations based on operating room observation. The medical illustration degree is perfect for students who have a passion for art and science. You’ll explore all aspects of health care, from the molecular level through the macroscopic and into the theoretical. Combining art and science, medical illustrators provide visual support for the health science and medical instruction fields. From traditional carbon dust renderings to three-dimensional, animated digital imagery, medical illustration spans the fullest range of artistic media. 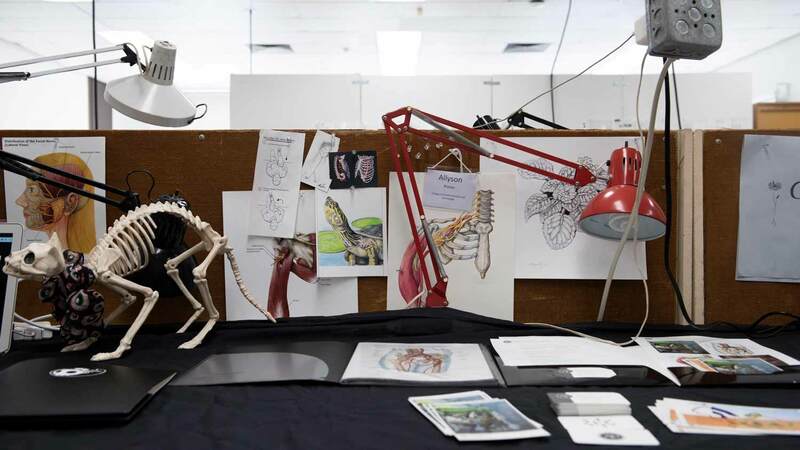 Building on a foundation of drawing and design, students learn how to translate anatomical and surgical sketches into instructional illustrations, courtroom exhibitions, computer graphics, ads, and more. 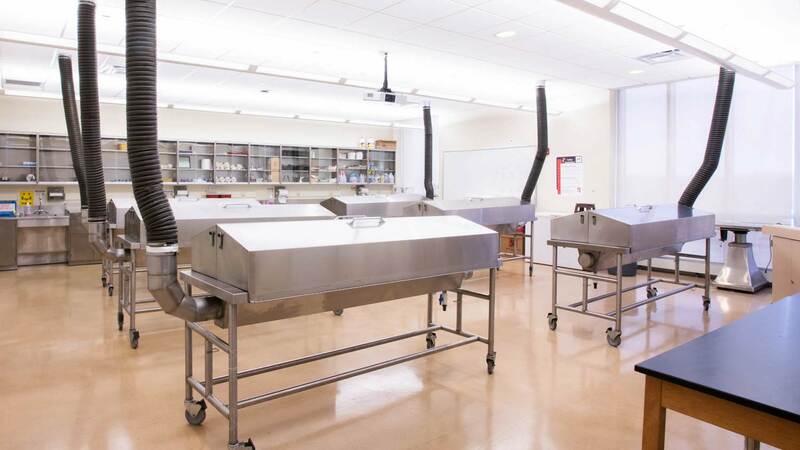 The major combines the study of the visual arts with science, including gross anatomy. Through collaboration with area hospitals, students are able to draw from direct observation of operations in progress. Digital technology integrated into the studio environment enables students to create highly polished, sophisticated images and well-designed, interactive, educational media presentations that include motion graphics and sound. Students may select electives that enhance their studies or allow them to pursue an area of personal or professional interest. Electives are available in graphic design, new media design, 3D digital graphics, illustration, graphic visualization, industrial design, interior design, fine arts studio, environmental design, ceramics, glass, metals, textiles, woodworking, filmmaking, and photography. To be eligible for these electives, students must complete the foundation program or have the permission of the instructor. Additional selections are offered as special topics courses. Adam Kubert '81 (medical illustration) has used his super drawing talent to make a successful career as a comic artist, working for DC Comics and now exclusively Marvel Comics. 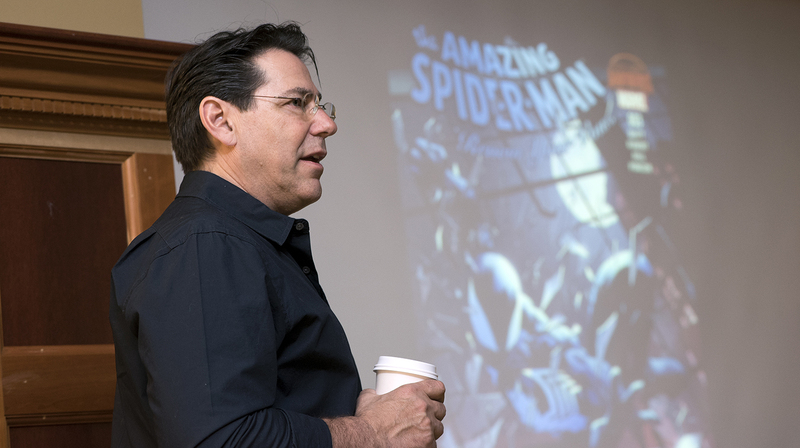 “Anatomy of a Comic,” will provide a behind-the-scenes look at how Adam Kubert ’81 illustrated an entire issue of Peter Parker: The Spectacular Spider-Man No. 305. RIT students this week are learning first-hand what it’s like to be a syndicated cartoonist, with Leigh Rubin, the creator of Rubes, as cartoonist-in-residence. This laboratory course complements the lecture material presented in Human Biology II. Lab experiments are designed to illustrate the dynamic anatomy and physiology of the human body organ systems. Recommended to concurrently take: MEDG-102 Human Biology II *Note: When taken with MEDG-102 the two courses together fulfill the Natural Science Inquiry Perspective. This course will provide students with instruction and assignments to practice and apply compositional picture plane dynamics using representational subject matter. Students will explore the principles of composition through the use of formal visual elements such as line, shape, value and color to achieve effective two-dimensional compositions. Learners will build upon their experience in 3D Design I including materials, and building processes, while constructing the human figure. Sculpted figures will portray accurate human anatomic structure, inference of function, and balance. This course will provide and in depth anatomical approach to drawing the figure. Students will obtain instruction and practice at drawing human anatomy including body and head postures, facial expressions, and hand gestures. Students will be taught anatomical proportioning while drawing from observation from models to convey emotions such as anger, sadness, fear, disgust, etc. Students will also learn to use photo support references. Works will be created in black and white and in color media using light and dark, and warm and cool effects. Students will learn to use industry-standard raster and vector illustration software to create images of assigned medical subjects. Students will also use page layout applications to combine digital images with text and other graphic elements. Course work emphasizes creation of illustrations to support medical education and publishing. An in-depth study of the structure of the human body. Emphasis is on understanding the relationships between anatomical structures as well as their form, texture, and color. Dissection of a human cadaver is supplemented with lectures on the structure and function of the major organ systems. Drawings of lab dissections and the skeleton will be translated into illustrations designed to support instruction in Human Gross Anatomy. Course teaches what choices need to be made when translating literal drawings into illustrations that support instruction. The target learner for these illustrations is a student attending Human Gross Anatomy at a graduate level. This course introduces strategies used to create NURBS and polygonal models of organic subjects in a three-dimensional environment. Assignments stress accurate portrayal of proportions, form, and texture. Instruction will also focus on creating lighting and shader networks that emphasize form and are consistent with surface characteristics. This course explores animating biomedical subjects and processes in their native environment. Students will be ask to research contemporary theory defining their subjects' anatomy and create animations consistent with their findings. Frame-by-frame animation, blend shapes, non-linear deformers and rigging systems will be introduced to permit students to choose the most effective method for creating motion and transformation. Students observe live surgical procedures and translate their sketches into finished illustrations that are used in medical training, patient education, and litigation. Demonstrations of sketching and rendering techniques are supplemented with lectures on general surgical principles and common procedures. This course is an introduction to two-dimensional computer illustration, animation, and interactive media as they apply to contemporary methods of instruction in medicine and allied health. Students will be assigned topics in health care and develop an interactive lesson to support instruction of their topic. Students will organize these lessons as a web site. This course continues the development of a student-created web site designed to assist teaching topics in medicine and allied health. Advanced topics in two-dimensional computer illustration, animation, and interactive media as they apply to contemporary methods of instruction in medicine and allied health, will be presented. † Art history electives are non-studio courses offered by the College of Art and Design or the College of Liberal Arts that examine the historical aspects of art, design, crafts, photography, print media, or film. ‡ Illustration Professional Electives include the following: Illustration I (ILLS-213), Digital Illustration I (ILLS-219), and Zoological and Botanical Illustration (ILLS-563). § CAD Studio Electives are courses designated by lab or studio contact hours in the course description. Studio art experience and a portfolio of original artwork are required for all programs in the schools of Art and Design. View the Portfolio Requirements for more information.